Now that's some Baloney. First time I've heard this specific bit of alarmist nonsense. Which boffins would they be? And what records would they be. Over what period? There are four primary temperature data sets that I am aware of. 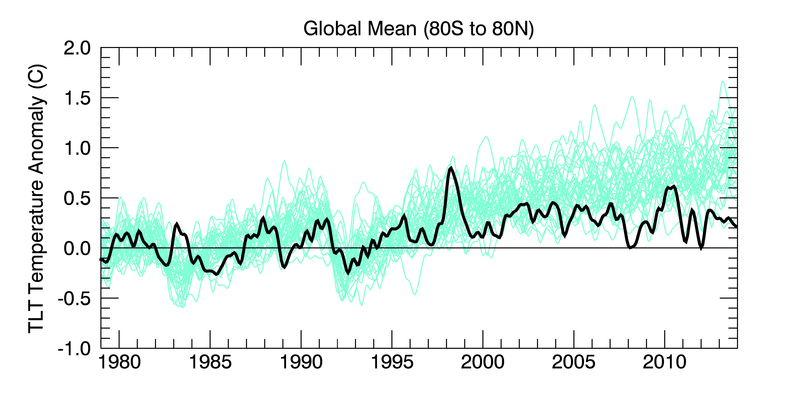 Carl Mears at RSS uses the term "denialist" to describe those who misrepresent his data. He is talking about you in that last sentence. Have a look at the graph from RSS. Notice that not one single data point from 1994 to the present is below the mean. When temperatures are above average there is warming. Baloney. Every year in the last five, at least, has been 'hottest on record' according to the boffins. Some would argue that this is very relevant, even a primary motivation. EDIT: I do apologize to newhaul for what was clearly insensitive to him, but I still disagree that future generations have nothing to do with this discussion. OK while they are talking about climate warming caused by C02 emissions, scientists are now warning about global cooling. And wait, thats not all. They are saying its because of the change in the activity from the Sun and not because of man made "pollution". "If the World does get cold all over with some places turning to ice do we need to look at Arctic sailing preparations for our sailboats. Just thinking. The sun's activity is in free fall, according to a leading space physicist. But don't expect a little ice age. "Solar activity is declining very fast at the moment," Mike Lockwood, professor of space environmental physics at Reading University, UK, told New Scientist. "We estimate faster than at any time in the last 9300 years." Lockwood and his colleagues are reassessing the chances of this decline continuing over decades to become the first "grand solar minimum" for four centuries. During a grand minimum the normal 11-year solar cycle is suppressed and the sun has virtually no sunspots for several decades. This summer should have seen a peak in the number of sunspots, but it didn't happen. But Lockwood says we should not expect a new grand minimum to bring on a new little ice age.Human-induced global warming, he says, is already a more important force in global temperatures than even major solar cycles. " Any reduction in global mean near-surface temperature due to a future decline in solar activity is likely to be a small fraction of projected anthropogenic warming. However, variability in ultraviolet solar irradiance is linked to modulation of the Arctic and North Atlantic Oscillations, suggesting the potential for larger regional surface climate effects. Here, we explore possible impacts through two experiments designed to bracket uncertainty in ultraviolet irradiance in a scenario in which future solar activity decreases to Maunder Minimum-like conditions by 2050. Both experiments show regional structure in the wintertime response, resembling the North Atlantic Oscillation, with enhanced relative cooling over northern Eurasia and the eastern United States. For a high-end decline in solar ultraviolet irradiance, the impact on winter northern European surface temperatures over the late twenty-first century could be a significant fraction of the difference in climate change between plausible AR5 scenarios of greenhouse gas concentrations. From the scientist who presented at the National Astronomical Society. I read somewhere in these ramblings that the sea level has risen dramatically,and that temperatures have also risen. I live on a small island just of the coast of europe and I can assure you that the sea level here has not risen, nor has the temperature. The winters are still bloody cold and the summers not much better. When did people stop believing their eyes but believing the crap that the media spout. Your small island is not the globe. Meanwhile, the sea levels have been changing...a lot! Weather and climate and two different entities. 95% , well I don't know about that number. .Increasing the amount of CO2 in the atmosphere from 0.03 per cent to 0.04 per cent has not caused and is not causing catastrophic runaway global warming. Dishonest references to “97 per cent of scientists” equate a mild warming influence, which most scientists agree with and more importantly can demonstrate, with a catastrophic warming influence – which most don’t agree with and none can demonstrate. The usual meme is "it's the same people who were part of the tobacco lobby who are now climate deniers"
Fred Singer was employed to show that second hand smoke is not detrimental. The MSM predicted cooling in the 70's. Science was 6:1 warming cooling. A few climate scientists have now scanned through the research literature of the time. For 1965 to 1979, they found seven articles that predicted cooling, 44 that predicted warming and 20 that were neutral. The results were published in the Bulletin of the American Meteorological Society. Newsweek in a particular had it really wrong. Peter Gwynne, the reporter, admits it. Use of that pejorative immedaitely stamps him as firmly in the alarmist camp. He's bound to try to wriggle his way out of what his data actually shows. No he's not. I started my graph in 1975 to show that several years in the previous 20 years has temperatures higher than some in the last 5 thus disproving the claim that the last 5 were the hottest on record. 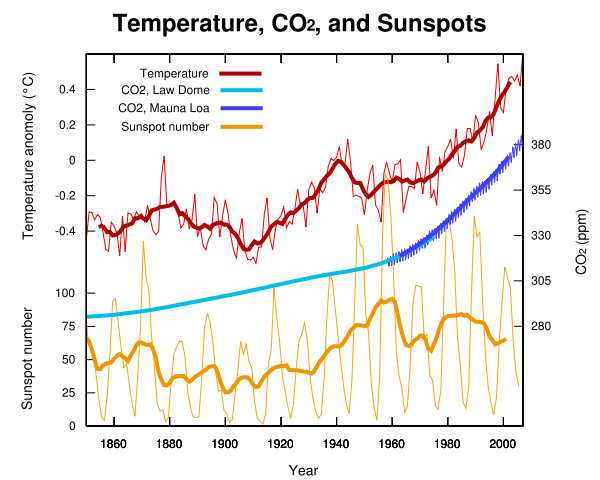 The way the "zero warming" trend line is derived is to extend back as far as possible from the latest date. It just so happens that that "zero trend line" currently terminates around 1997. No cherry pciking at all, that's just how the maths works out. Totally wrong, but a very common alarmist false argument. When temperatures are above the mean there WAS warming. It tells us nothing about what temperatures are doing now. Temperatures can cool after a peak for several years and still be above the mean. You are taller now than your average height throughout your life. Does that mean you are still growing? When I climb from a valley to a ridge line, I go up. When I am walking along the ridge line, I am above average altitude, but I am no longer going up. In fact I may well be going down for quite some time before I cross that average altitude line. Did you bother to read the web page you posted? ""If there is indeed a solar effect on climate, it is manifested by changes in general circulation rather than in a direct temperature signal." This fits in with the conclusion of the IPCC and previous NRC reports that solar variability is NOT the cause of global warming over the last 50 years." what gain is a useless carbon/ life tax gonna do for the planet?? who will benefit from taxation for nothing? climate change tax?? hell climate changes by itself it doesnt need humans to consider themselves mighty enough to change it permanently. "Momentum is building on both sides of the aisle for action on climate change through a market-based mechanism. A carbon tax could be one such mechanism, be nested within broader fiscal reform, and send a global signal in advance of the United Nations Climate Conference in Paris late this year." A carbon tax is simply a means of putting a cost on excess CO2. Any company that has waste products in a liquid or solid form has to pay to have it properly disposed. Are invisible gases exempt just because we cannot see them in the air? A carbon tax is collected from fossil-fuel companies upon the first sale at the mine, wellhead or port of entry. The money collected via this fee would be distributed to the public as a monthly “dividend” or “green check.” Distributing all of the revenue equitably to households will ensure that families can afford the energy they need during the transition to a clean energy future, and it should help win public support for a rising carbon fee. There is no government revenue and no corporate profit. There is just such a system in place in British Columbia.